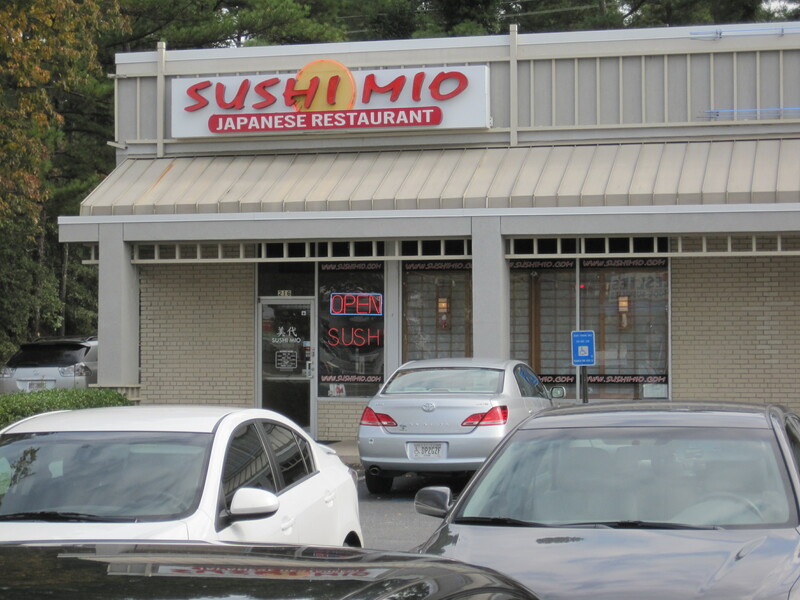 Sushi Mio is found in the strip mall on the southeast corner of Hilderbrand and Roswell Road, fairly close to F2O. It’s a neat place, with a good looking outside and a good looking inside. The pretty insides are one of the best things about this restaurant. I came during lunchtime, looking for something unassuming and fast. Yes, I know these places serve sushi but I was looking for other alternatives. The non-sushi offerings at lunch are relatively sparse, but they had udon, yakisoba, ramen and three different kinds of donburi. I had one of the rice bowls. 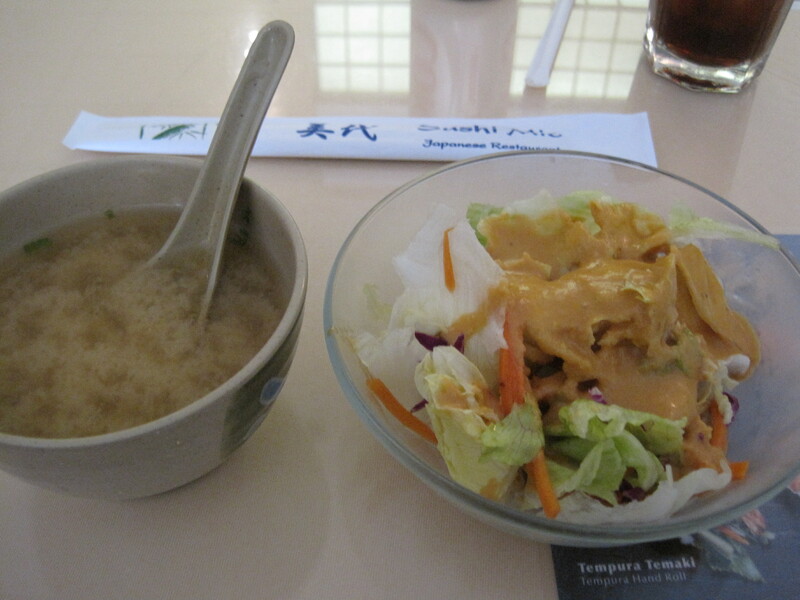 Miso soup and a salad came with the donburi. 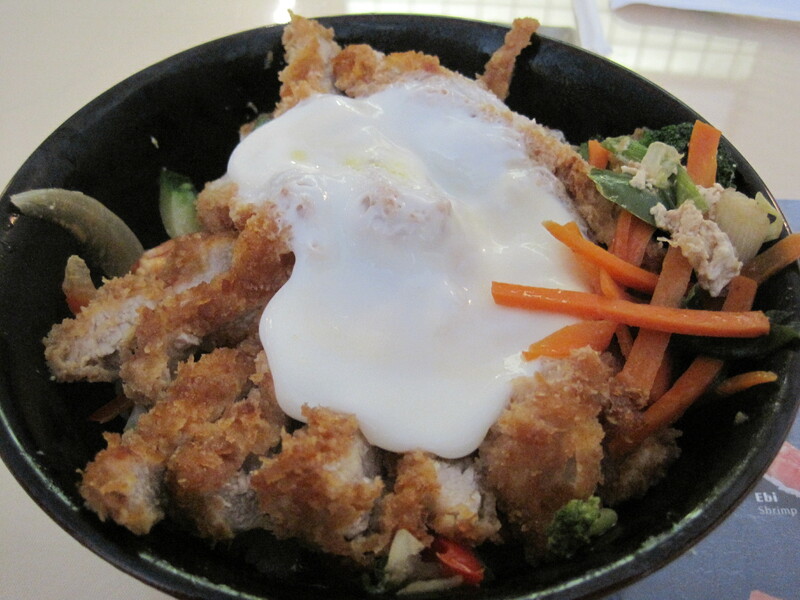 I enjoyed the donburi. 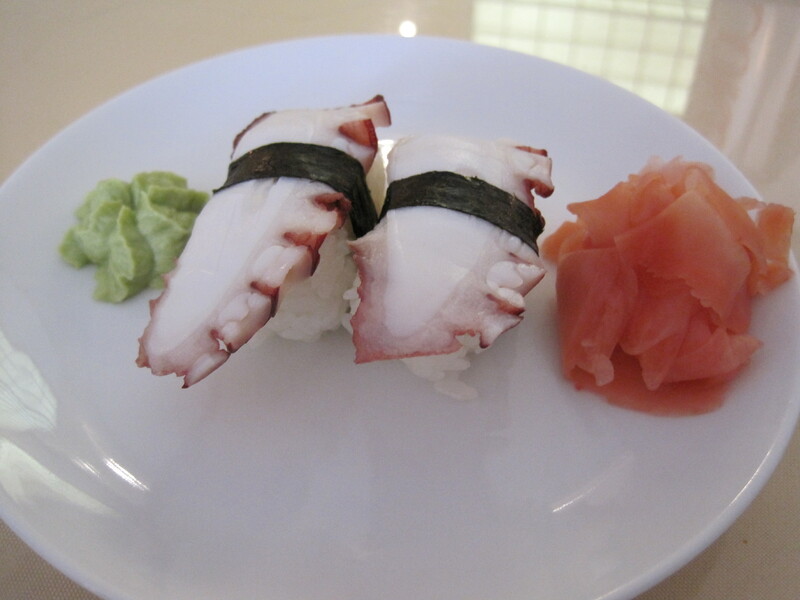 The octopus sushi wasn’t bad either, and the soup and salad hit the spot. Service was excellent, easily the best part of the restaurant for me. The calm pretty atmosphere is also a nice respite from most lunch places, which can be crowded assembly lines in this part of town. 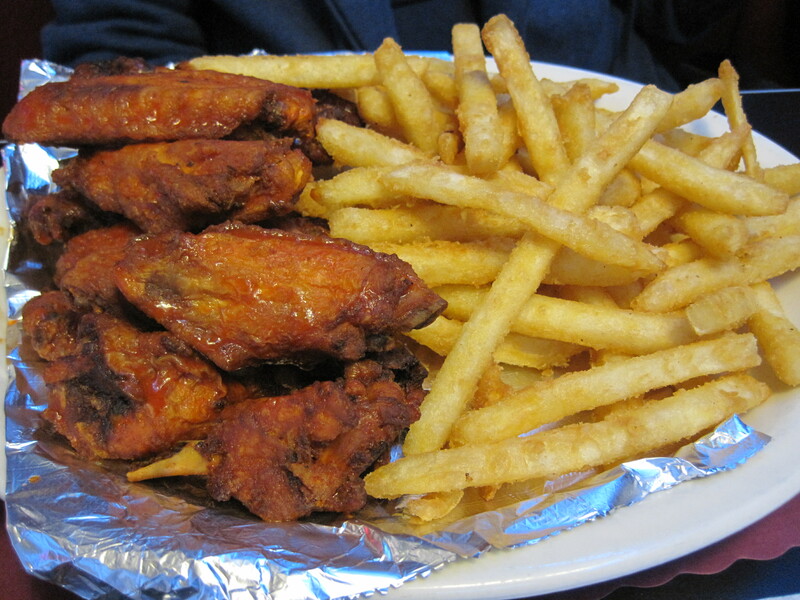 Verdict: Good looking, excellent service, good food. Recommended. Is the “Crazy Taco” an Atlanta original? 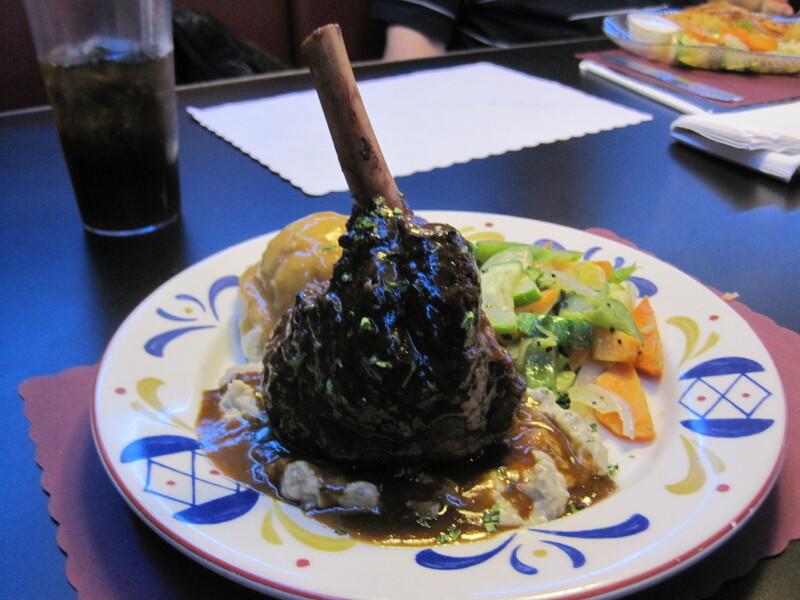 One of the problems with elevating one component of a cuisine over another is that you can denigrate the portion of the cuisine that has been dismissed. You can then effectively regard the “lesser” product as “substandard” and ignore it critically. I don’t think that’s what Cliff Bostock had in mind with his comments on Pure Taqueria, but I’ve been reading way too much Robb Walsh to not catch the potential implication: foods originating in Atlanta, created by Hispanics, that are largely targeted at “gringos” are critically insignificant and to be ignored. 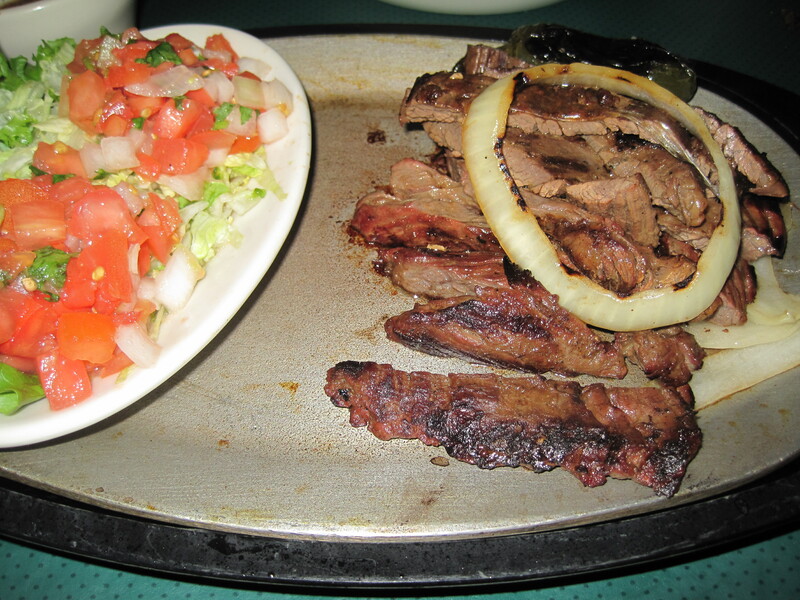 Nevertheless, there are a series of dishes in the Atlanta Tex-Mex restaurant repertoire I’ve not seen elsewhere. I have relatives (some of them are well known) all over Texas and spent my share of time in that state. 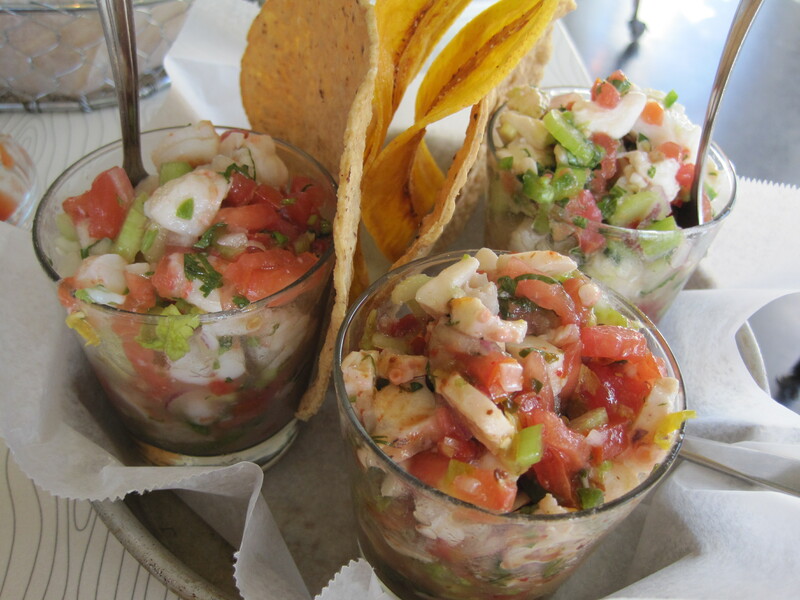 Some of these Atlanta Hispanic dishes are good, and if they are not seen anywhere else, aren’t they then Atlanta originals? I’m mostly interested in what Frontera Mex-Mex calls a Crazy Taco. 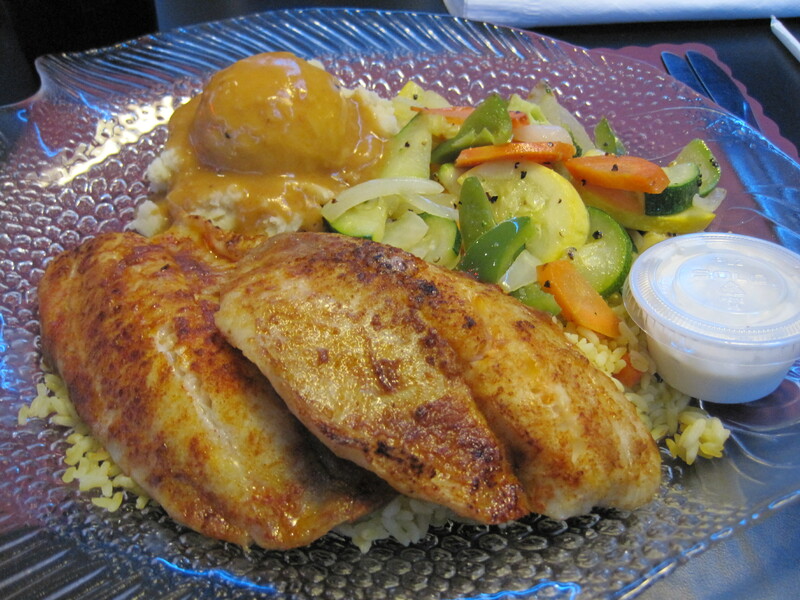 Usually done with a marinated chicken and covered with lettuce and white cheese, it’s cheap and quite good. Other places call it a Taco Loco. But where did it come from? Was this created by Hispanic Atlantans? Is it as original as chop suey was once believed to be? Are we ignoring a regional original in our haste to be “authentic“? I don’t have time to research this during the holidays but I thought I would toss out the question and let it circulate among Atlanta food bloggers. I’ll pick up on this after the Thanksgiving holidays. Myung Ga Won is just west of the intersection of Pleasant Hill and I-85, open 24 hours, and has been visited by two of the most active bloggers in Atlanta, Jennifer Zyman and Chloe Morris. The location is a bit hard to describe. From Pleasant Hill, it’s behind the McDonalds, though not really accessible by entering the McDonalds parking lot. It’s roughly across the road from the nearby Cafe Mozart, a description that would only make sense if you’re in the Cafe Mozart lot. That said, it’s easiest for me to do just that, enter the parking lot of Gwinnett Mall Corners and then cross the road (Day Drive) to Myung Ga Won. One other item of note, it’s cash only. If you come, pick up a couple 20s on the way. That said, it’s two stores high, and kind of light, fashionable and modern in decor. It’s not as heavy and formal, as say, Mirak Korean. Panels made of laminated wood are everywhere, forming tables, seating and walls. And because of the wild hours, once you sit, there is a button to call the waitress. The menu is classically Korean, and as I didn’t want to buy bulgolgi once again, I tried a dish whose English name is “spicy pork stir fry” and in Korean goes by jae yook bokum. 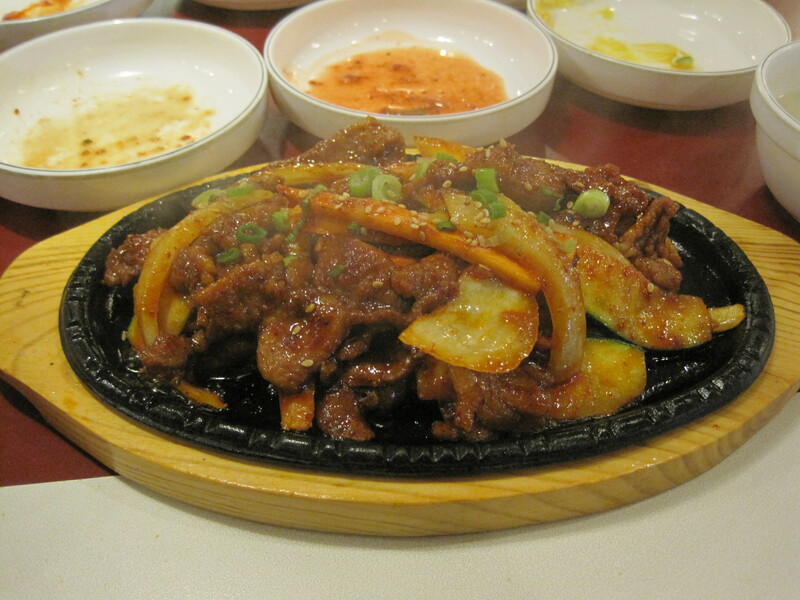 jae yook bokum, or spicy pork stir fry. It’s tasty. 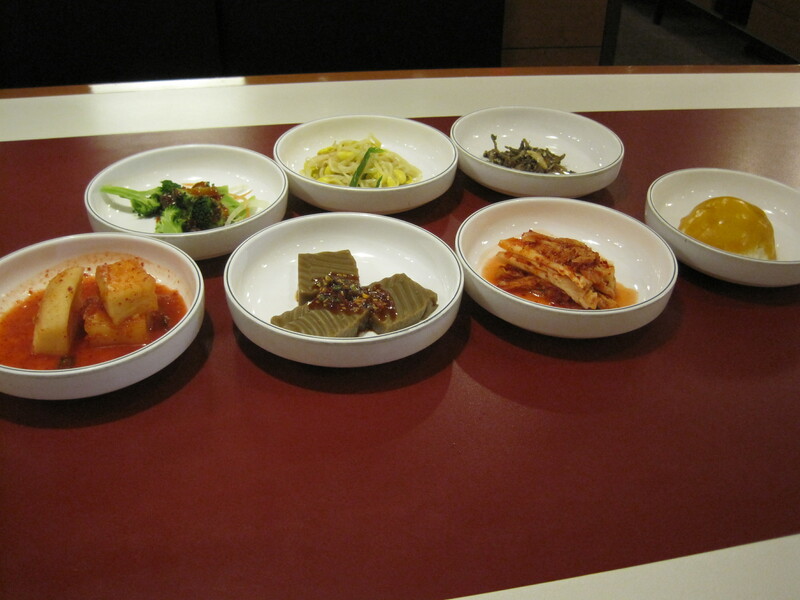 The banchan were also good, and the utensils here are all of steel. You get a pair of chopsticks and a spoon. The chopsticks are for eating, and the spoon, if I recall correctly, is for the rice. The time I went, the receptionist appeared to be the only “native” English speaker, a girl who looked to be of mixed parentage. I asked about that, as my daughter is 1/4 Japanese and has issues because of it. (Asians think she’s American. Americans think she’s Asian. Hispanics get mad at her because she has dark features and she doesn’t reply to them in Spanish.) That said, despite the very Korean clientele, it’s not much different from any late night spot. A guy in a Dallas Cowboys jersey sat talking to a man in Puma gear. Three women, well dressed and in fashionable coats, sat chatting and sipping warm drinks. People flowed up and down the stairs, usually friendly and open. I like it. It’s a heavier late night alternative to something like, oh, IHOP. 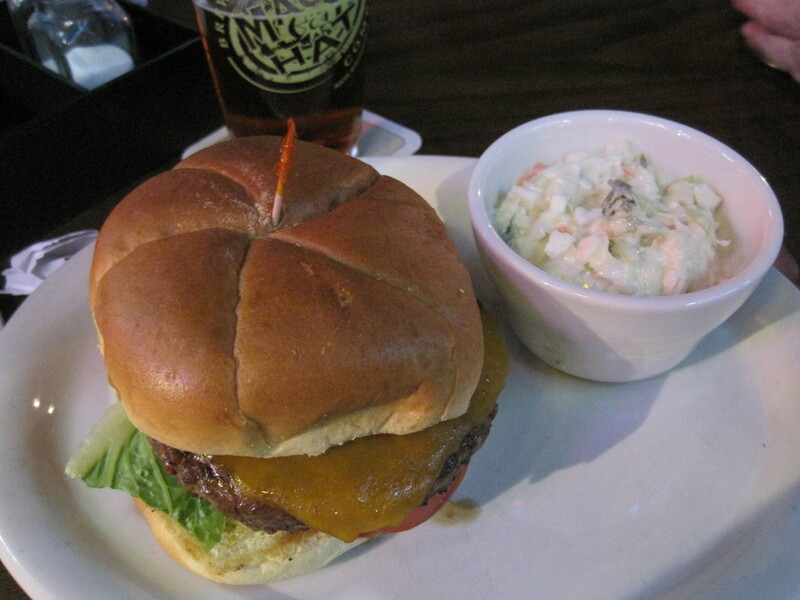 The meat is so marbled, the fat content so awesome, that the burger has a creamy buttery texture that no other burger has. Summits is on Highway 78 just a block or so south of the Highway 78-Highpoint Road intersection and on Sundays they show every NFL game. It’s a good stop, and the fans are, for the most part, civil with each other. 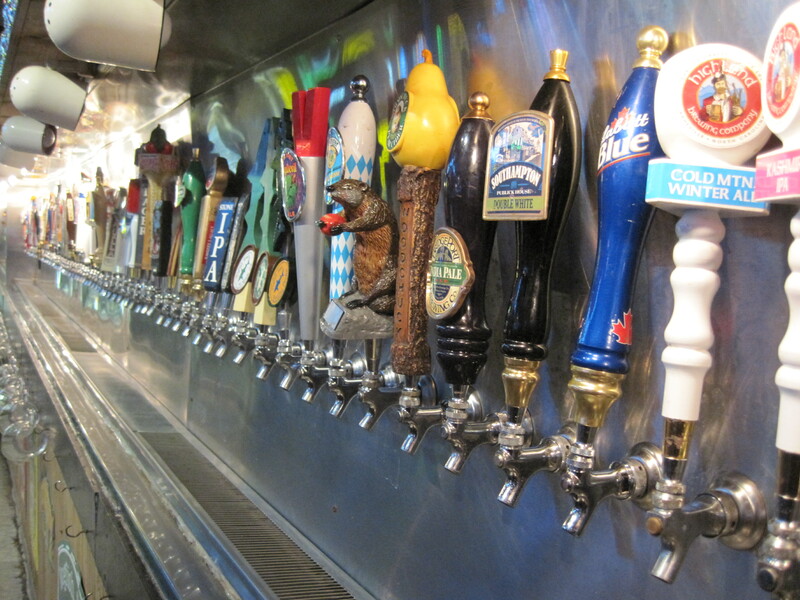 Oh yes, before I step out, the infamous wall of taps at Summit. And this photo can’t encompass all of it. If you’re a regular NY Times reader, you probably won’t have missed this, but to remind me (and give a link I can pass on to family), I’ll note that Mark Bittman, author of “How to Cook Everything”, has a list of 101 easy starters to make for Thanksgiving. The other comment, more of a tip, is that good newspapers have a “printable” mode for long articles, that you can find. If you use it, it’s far more readable as all the text ends up on one page and almost all the ads go away.